The launch of the University of Pennsylvania's 2015 Global Think Tank Ranking Report found Ecologic Institute increasing its position in several categories while remaining a top ten environment think tank for the sixth year in a row. Ecologic Institute placed at 9th position amongst 95 eligible institutions in the category Top Environment Think Tanks, a grouping assessing leading environmental policy institutions on a global level. Ecologic Institute was represented in a number of additional categories. Amongst Top Think Tanks in Western Europe, Ecologic Institute was at position 33 – the highest ranking for any environmental, energy or resource Think Tank in this category. In a significant increase in ranking compared to 2014, Ecologic Institute was listed at position 53 for Think Tanks with the Most Significant Impact on Policy, representing the only environmental institution on this list. Moreover, the Institute maintained its position at 25 for Think Tanks with the Best Use of Media (Print or Electronic) and placed 28th in the Best Managed Think Tanks category. Finally, Ecologic Institute was placed for the first time in the category Top Energy and Resources Policy Think Tanks, coming in at position 52. The Institute also achieved a ranking of 16 from 58 institutions in the new category Best Quality Assurance and Integrity Policies and Procedures. 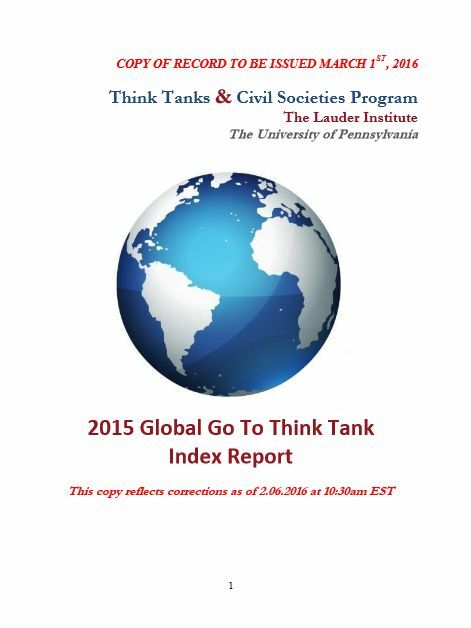 The Global Go To Think Tank Index is an Initiative of the University of Pennsylvania. The rankings are the result of a worldwide nomination and selection process contributed to by 4677 researchers, peer institutions, journalists, political decision makers, as well as public and private donors. The evaluated criteria include: the quality and reputation of an organization's research; academic performance; quality, number, and influence of publications, and; implementation of research results and policy advice. The Global Go To Think Tank Index 2015 was released on 27 January 2016 simultaneously in New York, Washington, D.C., and Berlin.